The matcha green tea macarons that I shared last week were delightful by themselves, but I really wanted to incorporate them some way into an entremet cake. That’s where this chocolate and matcha green tea entremet with a chewy dark chocolate brownie layer, vanilla crémeux, chocolate joconde cake, a thin layer of matcha mousse, glaçage au chocolat, and, of course, a matcha macaron comes in. Admittedly, this entremet is more chocolate than matcha. While I was making the entremet I realized that it was too tall to fit any more matcha mousse in, which was disappointing. I also had to remove some matcha mousse later on, but I’ll get to that soon. Making this cake was quite a pain because I ended up doing most parts of it twice. The first time I made the brownie layer I burnt it. I really burnt it, not just over baked it. The bottom was black and it was not just dry, but it was actually hard. The vanilla crémeux (which is like vanilla pastry cream with added gelatin) also did not go so well. I did not stir the hot milk into the eggs slowly enough, and so the eggs ended up curdling. My vanilla crémeux ended up being vanilla scrambled eggs. Gross. The chocolate joconde layer went well, which was good because I was quite annoyed after my previous failings. The matcha mousse went well too, and came together pretty simply (after I realized half way through making it that I was out of whipping cream and ran to the grocery store at 10pm). Originally, I had intended to use matcha jelly as the final layer of the entremet instead of the chocolate “mirror” glaze (which in French is called glaçage au chocolat) I ended up coating it with. The entremet did at one point have matcha jelly. I had waited for the matcha mousse to set, and then poured on the matcha jelly glaze on top. Unfortunately, the matcha mousse did not set terribly well and so little specks of mousse ended up in the jelly, which made the jelly look murky. I decided to make some more jelly and pour it on top, in hopes of covering up the not very nice looking layer underneath. After letting the cake sit overnight in the fridge, I noticed that the matcha jelly, just like the mousse, did not set very well. Ugh. I decided (for some reason I’m not entirely sure of) to remove the pastry ring that kept the entire cake together. This caused roughly a quarter of the matcha jelly to slide off of the cake, drip down the rest of the layers, and form a matcha jelly puddle on my counter. I threw everything back in the fridge, unsure of what to do. At 5:30am (yeah, I was still awake), I decided I would scrape off the rest of the jelly and try something else instead. So I did. I scraped off the jelly, and with it came off a bit too much matcha mousse. That’s why there’s such a thin layer of mousse. Oh well. I am quite pleased, however, with the final layer of glaçage au chocolat. This was my second time playing with mirror glaze (last time I used it for the Ambroisie) and I am happy to report that my glazing skills have really improved since then. The key is to make sure that the cake is completely frozen before glazing, and also to use a glaze that is not too hot. Then, all you have to do is pour it on. That’s the tricky part though: stopping once your pour it on. I had this urge to whip out my spatula and start smoothing it out a little, but that is far more likely to damage the glaze. I found that blowing on the glaze, which does of course makes you look a little bit crazier than usual, is the most effective way to smooth out any bumps. To get the neat splatter effect on the mirror glaze (and chocolate garnish), I took some food colouring (shades of green and white), dissolved it in tiny splash of vodka, dipped a paintbrush I use for food in it, and flicked my wrist towards the cake while holding the brush. I made sure that the mirror glaze and chocolate decorations were completely set before I started, otherwise the food colouring would have just been absorbed into the chocolate. I found that using white food colouring is very helpful in achieving bright, bold colours. Otherwise, the colours are very dark and just blend in with the chocolate. If you cannot get white food colouring, and do not have really bright food colouring, I suggest not doing the splattering. White food colouring can be a bit tricky to find though, so ordering online is always a good option. White food colouring has a ton of great uses, like lightening frosting colours or painting signs for a TARDIS cake, so it’s worth the investment. If you are not a fan of food colouring, then of course you can simply skip this entirely optional and purely decorative step. Avoid mixing together different types of food colouring (i.e. gel, liquid, and powdered) for splattering. The food colouring I used for splattering the entremet was originally green, but the green got absorbed into the chocolate and left only the white. I am not really sure why, but I am guessing that it was because I mixed different types of food colouring together (I used a liquid white but a gel green). I might be wrong though. Anyone have any ideas? Also, I’m noticing that my recipes just seem to get longer, and longer. I think I need to share some less time consuming ones! Next week? 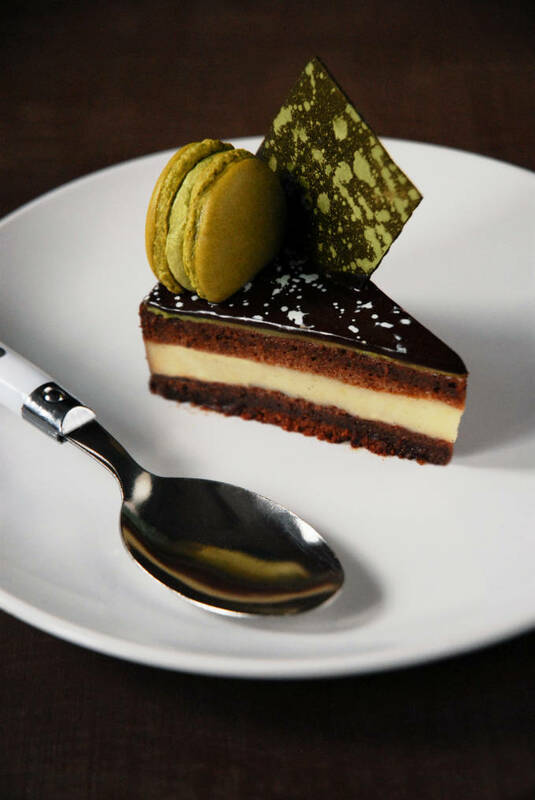 A recipe for a delightful entremet cake with a brownie layer, vanilla crémeux, chocolate joconde cake, matcha mousse, glaçage au chocolat, and a matcha macaron. Since this recipe is so precise I am only giving mass measurements. I really wouldn't suggest doing this without a scale. Preheat oven to 350°F and line an 8 x 8 pan with parchment paper. In a medium sized bowl set over a pot of barely simmering water, melt together butter and chocolate, stirring frequently. You can also do this in the microwave in short twenty seconds bursts, stirring well in between each one. Whisk in the sugar, egg, vanilla, and salt. Fold in the flour until just incorporated, and then pour the batter into the prepared pan. Bake for 15 to 20 minutes, until a toothpick inserted into the center of the pan of brownies comes out clean. Let cool to room temperature. Preheat oven to 400°F and line an 8 x 8 pan with parchment paper. Sift together the cake flour and the cocoa powder. Set aside. Combine the almond powder, powdered sugar, egg yolks, and the egg whites together. Whisk until thick and pale. In a separate clean bowl prepare the meringue by whisking the egg whites until they are foamy and then adding in the sugar a little at a time until the egg whites form stiff peaks. Fold some of the meringue into the yolk mixture to lighten it. Add in the sifted flour mixture and fold well. Fold in the melted butter. Fold in the rest of the meringue. Bake for ten minutes. Let cool to room temperature. Sprinkle the gelatin over the water. Whisk together the egg yolks and sugar together until they are a pale yellow. Sift together the flour and cornstarch and then whisk them into the egg yolk mixture until you get a smooth paste. Meanwhile, bring the milk and vanilla to a simmer (small bubbles) in a saucepan over medium heat. Remove from the heat and add slowly to the egg mixture, one drop at a time and then in a steady stream, constantly whisking. Then, pour the mixture back into the saucepan and cook over medium heat until very thick, stirring constantly. Pass through a sieve if your eggs curdled (if there are pieces of egg in your pastry cream). Stir in the gelatin until it melts. Let cool to room temperature, stirring every now and then. Make creme anglaise by boiling the milk, matcha, and vanilla in a pot. Meanwhile, whisk the egg yolks and sugar in a bowl. Temper the yolks with the boiled cream by slowly pouring it in while whisking and return back to the pot under a low heat. Keep stirring until thick. Take the mixture off the heat and strain. Add the softened gelatin and stir until it melts. Let cool and then fold in the whipped cream. Mix the hot water and sugar together until the sugar completely melts. Place a 7-inch round pastry ring, if you have one, on a tray that fits into your fridge or alternatively use an 8 x 8 pan lined with tinfoil so that there is overhanging tinfoil from the sides (which you will use to lift the cake up later). Cut the brownie layer so that it fits into the ring or pan nicely. Pour about half of the simple syrup on top of the brownie layer so it is absorbed. Spread the vanilla crémeux on top. An offset spatula helps get it nice and smooth. Place a layer of chocolate joconde cake on top. Pour the rest of the simple syrup over it. Cover with as much matcha mousse as you would like (or that will fit). You may have a bit extra. Let sit in the fridge for at least two hours, and then place in the freezer to freeze completely. Sprinkle the gelatin over the 60g of water. Bring the rest of the water, sugar, and cocoa powder to a boil in a medium sized saucepan. Add the cream and bring back to a boil. Remove the saucepan from the stove and strain the mixture. Stir in the dissolved gelatin until it melts. Let the mixture cool for a few minutes (about 35°C or 95°F is ideal), making sure to stir occasionally to prevent a film from forming. Don’t let it cool completely as the glaze should be warm for the next step. Remove the entremet from the freezer. Warm the sides of the pastry ring using a flame, and then slide the entremet out. If you used tinfoil, just remove it. Place the entremet on a bowl flipped upside down on a wire rack such that only the center of the entremet is supported by the bottom of the bowl. Pour the warm glaze over the frozen entremets. Place in the fridge until ready to eat. Place matcha macarons around the cake. Temper the dark chocolate (you can find my instructions here), spread it thinly on a piece of parchment paper, and then cut into squares. To create the splatter effect on the cake or chocolate, first make sure the chocolate or glaçage is completely set. Mix together the food colouring until you get a matcha-like shade of green. Add a little bit of vodka. Dip your paintbrush in the food colouring, and then flick your wrist towards the cake or chocolate. Let the food colouring dry for a few minutes. Place the chocolate squares on the cake if you made them. Wow, this is spectacular! It looks like it came from a professional pastry shop. I love it! I love the splatter design, and hope that your next endeavour goes slightly more smoothly. It looks gorgeous! That is an extremely complicated cake, but it does look quite wonderful. The glaze is nicely done too. I’m not much of a matcha person, but I could definitely see this with a raspberry mousse instead. one of these days I should try getting more fancy. Long, sure. Complex, obviously. But it looks amazing. I would eat so much of that cake. Kudos for the overnighter producing that beauty! 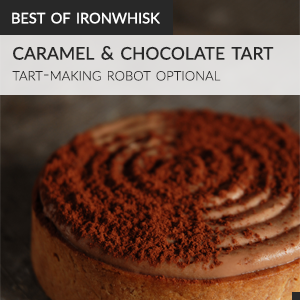 omg, you’re a pastry genius!! This looks like a dessert from the finest French restaurants. I can only imagine how labor-intensive it must’ve been to create it. Pinned! Gorgeous!!! I am impressed really impressed as these entremets takes time. I want you to be my teacher and teach me how to bake everything! This is simply so gorgeous and hard to take my eyes off from this cake! Looks gorgeous….was it hard to make?